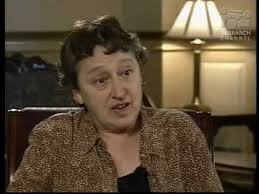 Lynn Margulis is a theoretical biologist and professor of botany at the University of Massachusetts at Amherst. Her research on the evolutionary links between cells containing nuclei (eukaryotes) and cells without nuclei (prokaryotes) led her to formulate a symbiotic theory of evolution that was initially spurned in the scientific community but has become more widely accepted. Margulis, the eldest of four daughters, was born in Chicago. Her father, Morris Alexander, was a lawyer who owned a company that developed and marketed a long-lasting thermoplastic material used to mark streets and highways. He also served as an assistant state's attorney for the state of Illinois. Her mother, Leone, operated a travel agency. When Margulis was fifteen, she completed her second year at Hyde Park High School and was accepted into an early entrant program at the University of Chicago. Margulis was particularly inspired by her science courses, in large part because reading assignments consisted not of textbooks but of the original works of the world's great scientists. A course in natural science made an immediate impression and would influence her life, raising questions that she has pursued throughout her career: What is heredity? How do genetic components influence the development of offspring? What are the common bonds between generations? While at the University of Chicago she met Carl Sagan, then a graduate student in physics. At the age of nineteen, she married Sagan, received a B.A. in liberal arts, and moved to Madison, Wisconsin, to pursue a joint master's degree in zoology and genetics at the University of Wisconsin under the guidance of noted cell biologist Hans Ris. In 1960, Margulis and Sagan moved to the University of California at Berkeley, where she conducted genetic research for her doctoral dissertation. The marriage to Sagan ended before she received her doctorate. She moved to Waltham, Massachusetts, with her two sons, Dorion and Jeremy, to accept a position as lecturer in the department of biology at Brandeis University. She was awarded her Ph.D. in 1965. The following year, Margulis became an adjunct assistant of biology at Boston University, leaving 22 years later as full professor. In 1967, Margulis married crystallographer Thomas N. Margulis. The couple had two children before they divorced in 1980. Since 1988, Margulis has been a distinguished university professor with the Department of Botany at the University of Massachusetts at Amherst. Margulis' interest in genetics and the development of cells can be traced to her earliest days as a University of Chicago undergraduate. She always questioned the commonly accepted theories of genetics, but also challenged the traditionalists by presenting hypotheses that contradicted current beliefs. Margulis has been called the most gifted theoretical biologist of her generation by numerous colleagues. A profile of Margulis by Jeanne McDermott in the Smithsonian quotes Peter Raven, director of the Missouri Botanical Garden and a MacArthur fellow: "Her mind keeps shooting off sparks. Some critics say she's off in left field. To me she's one of the most exciting, original thinkers in the whole field of biology." Although few know more about cellular biology, Margulis considers herself a "microbial evolutionist," mapping out a field of study that doesn't in fact exist. As a graduate student, Margulis became interested in cases of non-Mendelian inheritance, occurring when the genetic make-up of a cell's descendants cannot be traced solely to the genes in a cell's nucleus. For several years, she concentrated her research on a search for genes in the cytoplasm of cells, the area outside of the cell's nucleus. In the early 1960s, Margulis presented evidence for the existence of extranuclear genes. She and other researchers had found DNA in the cytoplasm of plant cells, indicating that heredity in higher organisms is not solely determined by genetic information carried in the cell nucleus. Her continued work in this field led her to formulate the serial endosymbiotic theory, or SET, which offered a new approach to evolution as well as an account of the origin of cells with nuclei. Prokaryotes--bacteria and blue-green algae, now commonly referred to as cyanobacteria--are single-celled organisms that carry genetic material in the cytoplasm. Margulis proposes that eukaryotes (cells with nuclei) evolved when different kinds of prokaryotes formed symbiotic systems to enhance their chances for survival. The first such symbiotic fusion would have taken place between fermenting bacteria and oxygen-using bacteria. All cells with nuclei, Margulis contends, are derived from bacteria that formed symbiotic relationships with other primordial bacteria some two billion years ago. It has now become widely accepted that mitochondria--those components of eukaryotic cells that process oxygen--are remnants of oxygen-using bacteria. Margulis' hypothesis that cell hairs, found in a vast array of eukaryotic cells, descend from another group of primordial bacteria much like the modern spirochaete still encounters resistance, however. The resistance to Margulis' work in microbiology may perhaps be explained by its implications for the more theoretical aspects of evolutionary theory. Evolutionary theorists, particularly in the English-speaking countries, have always put a particular emphasis on the notion that competition for scarce resources leads to the survival of the most well-adapted representatives of a species by natural selection, favoring adaptive genetic mutations. According to Margulis, natural selection as traditionally defined cannot account for the "creative novelty" to be found in evolutionary history. She argues instead that the primary mechanism driving biological change is symbiosis, while competition plays a secondary role. Margulis doesn't limit her concept of symbiosis to the origin of plant and animal cells. She subscribes to the Gaia hypothesis first formulated by James E. Lovelock, British inventor and chemist. The Gaia theory (named for the Greek goddess of Earth) essentially states that all life, as well as the oceans, the atmosphere, and Earth itself are parts of a single, all--encompassing symbiosis and may fruitfully be considered as elements of a single organism. Margulis has authored more than one hundred and thirty scientific articles and ten books, several of which are written with her son Dorion. She has also served on more than two dozen committees, including the American Association for the Advancement of Science, the MacArthur Foundation Fellowship Nominating Committee, and the editorial boards of several scientific journals. Margulis is co--director of NASA's Planetary Biology Internship Program and, in 1983, was elected to the National Academy of Sciences.